It is with a heavy heart that I write my first article since the passing of one of my two best friends-Andy Glazer. I am proud of the fact that I have handled myself with the highest honor and integrity over all of my adult life and Andy and I were like minded in this way. We both saw how the other acted “When the chips were down.” It is difficult for me to lose one of only a few people that really knew me. Thank you Andy, for all of the love, support, and help writing “Play Poker like the Pros.” Andy’s sister is starting an “Andy Glazer Scholarship Fund.” This will be funded, in part, by 10% of the royalties on the above mentioned book, as well as with Andy’s new “Idiots Guide to Poker,” which was a plum writing assignment for Andy to pick up. The “Idiot” book that Andy had just finished writing will be out by September. As I page through month old Card Player magazines, I see a big picture of Andy on the inside of the back cover, various other pictures of Andy, as well as two huge articles per each issue. Much like Andy’s impact in Card Player was his impact on the poker world: he was everywhere! He covered more tournaments a year than I played in. He was a big part of the modern poker world and his passing will leave a hole which no one will be able to fill as well as Andy, with his great writing style and gentle persona. He had everyone’s respect, and I have never, ever, heard anyone say anything bad about Andy. Try to imagine this: three of us are sitting in a huge hot tub right next to the ocean, under a beautiful cliff; I’m feeling calm and serene when Andy jumps up (naked! )-all six-feet two-inches of him-and takes two steps towards me while thrusting out his hand and says, “Hi I’m Andy Glazer, nice to meet you.” I shake his hand, and then he turns to his friend and says, “Phil saying he plays ‘A little poker’ is like Michael Jordan saying he plays ‘A little basketball. '” With this introduction made; the next thing you know Andy has sent me his book “Casino Gambling the Smart Way,” looking for a jacket blurb. A few years earlier Andy was on his way as a successful attorney in Atlanta. One reason that Andy quit practicing law was that he had a case in which the defendant was obviously guilty (Andy considered the case un-winnable), and the issue of when the trial was to happen was to be decided in a hearing. Andy saw an opportunity: he knew that the DA wasn’t ready to go to trial, and he had the option of going to trial immediately in this particular hearing. Feeling that he couldn’t win in any case, Andy quickly prepared himself, and then surprised the DA by saying he was ready to go two days later. With the DA unprepared Andy won the case for his client. In doing his job well and securing the winning verdict, it nonetheless left a bad taste in his mouth, especially after more drug dealers flocked to his office door. So Andy decided to give up the money and prestiges associated with being a successful criminal defense attorney; and pursue the thing that he had loved so much in college, while writing for the school newspaper. After a brief sojourn where he created a video for aspiring law students, a writing career was to be his next move. About that time, Andy was on a two week long vacation to Esalan that ultimately turned into a twenty-month-plus long stay! During his stay he cooked vegetarian food in the kitchen, gave massages, and had one heck of a good time by all reports. This is an integral part of the Andy following his dream theme, and he remained well-connected to Esalan until the end of this life. Andy’s time at Esalan was spent having fun, exploring himself, and becoming a better human being. At the time of our initial meeting I had decided to write my auto-biography which Andy eventually had the idea of calling “Poker Brat.” I was deciding who I wanted to write it with, Andy or Dana Smith, when Andy moved up to Palo Alto and made my decision that much easier. While Andy and I stalled on that book, and in truth didn’t finish more than one or two chapters (none collaboratively), Andy started trailing me on the poker circuit to gain insight into my life. One day he comes up to me and says, “Phil I’ve accepted the job of tournament reporter at the WSOP (World Series of Poker).” The next thing I knew Andy was writing columns for the Detroit Free Press, Card Player, and various websites throughout the world. Andy had given up being a highly successful attorney in Atlanta in order to follow his dream of becoming a writer. One thing about Andy was that he took losing hard, even harder than I do. He always looked back at Tunica’s championship event the year Humberto Brennes won it (in 2002), because he had a ton of chips and lost most of them when the flop came down 7-8-9, with his Q-10 to Humberto’s J-10. I was at the table for that hand. I can tell you that that hand bothered him for two years afterwards. By the end of his life things were really coming up roses for Andy. He assisted me with my book “Play Poker like the Pros,” he had just finished his book “The Idiots Guide to Poker,” he had won two tournaments in Australia in January (one fresh off of the 16-hour long plane trip), and he had just signed a lucrative contract with “FinalTablePoker.com” (he loved Diego Cordovez’s assurances that he could write exactly what he wanted to write). I believe that Andy has almost 400,000 words from all of his WSOP writings, and he was planning on having me and a few others help him turn “The highlights” into a book. Andy left a lot on the table. 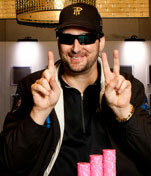 Like many of us, he dreamed of winning the WSOP main event, World Poker Tour tournaments, and other WSOP events. I believe he would have written many other books; for sure he would have continued to be the best writer in the poker world; he would have won many poker tournaments (especially in Seven Card Stud, where his recent results were impressive); and I have faith that he would have finally found what he was looking for in a solid wife and children-he was great with my kids. After his funeral, we had a “party” where we celebrated stories about his life. Andy had a list of the “Top 100 movies of all-time” and would openly debate anyone over his beloved list-Andy I loved you, but “Hopscotch” and “Stripes” didn’t belong in the top five! Andy had three or four “loves of his life” get away (he lived and loved). He supported me and defended me for years on RGP, and in other forums. He listened to me and counseled me when I was feeling down: one memorable time taking my phone call at 3:00 am! Andy loved his mother, his sister (Donna), his brother-in-law (Ken), his friends (like Howard Ring, Chuck Humphreys, Michael Konig and Wendeen Eolis), “Star Trek,” “Star Wars,” “Highlander” (“There can be only one!”), poker, women, The Michigan Wolverines (he sweated every play! ), hot tubs (he owned a famous movie stars former hot tub and kept it in his backyard in LA), baseball rotisseries with his old friends like Howard Ring (I remember him spending so much time on this), the NCAA basketball tournament (where he would watch as many games as possible), my wife, my sons and his dreams. Andy was a true blue friend to me, a man of honor, courage, and gentleness; and a man that I could trust with my very life. I’ll really miss Andy Glazer and watching him follow his dreams. Pot Limit Omaha – What a Game!